Set the WayBack Machine for 1989, Sherman. We’ve got to go back a bit before I get into the meat of this review because it’s important. Trust me. Even back in 1989 I had a reputation among my friends and family as a movie guy. That’s because I went to the movies two or even three times a week. This is 1989, remember. There is no Netflix, no Hulu, no Internet, no DirecTV, no 500 HD movie channels, no DVD, no Blu-Ray. VHS is king. So I would frequently take in a movie during the week with my buddies after work, maybe go to one by myself and then take Patricia (we’d been married five years by now) on the weekend. Got the picture so far? Good. In the spring/summer of ’89 I was besieged by friends of mine who constantly asked me had I seen this Hong Kong action movie that was like nothing they had ever seen before and I absolutely had to see this thing as it would change my movie going life forever. Matter of fact, friends were telling me that this movie topped “Die Hard” and I really couldn’t believe that as I thought “Die Hard” was just about the best action movie I’d ever seen in my life up to that point. So I finally decide to go see this movie. Problem is that it’s playing only at one theater; an arthouse cinema on the East Side around 23erd St somewhere and the movie is only showing three times a day. And all those showings are during the early part of the day while I’m working. With the first showing of the day around 10 or 11AM. Something like that. Hey, no problem. It’s the warm weather season and I don’t need much of an excuse to play hooky anyway. So I call in sick and determine I’m gonna check out this movie that everything insists I just have to SEE to believe! I get to the theater, pay for my ticket, go in and I’m surprised to see that at this time of day the theater is packed. I get one of the very few seats remaining, sit back and wait to see what everybody has been telling me is so mollyfoggin’ amazing. One hundred and eleven minutes later I stumble out of the theater with the rest of the audience as if I’m Moses who’s just seen The Burning Bush. Some of the audience members have seen this movie three, four or even five times already and soon I am engaged in a discussion those other people about the movie. In fact, about a dozen of us become fast friends due to our mutual admiration of movies in general and this movie in particular so we go out to get something to eat and then come back to catch the third and last showing of the day which is even more packed than the first showing to the point that people are standing in the back of the theater or sitting on the floor. 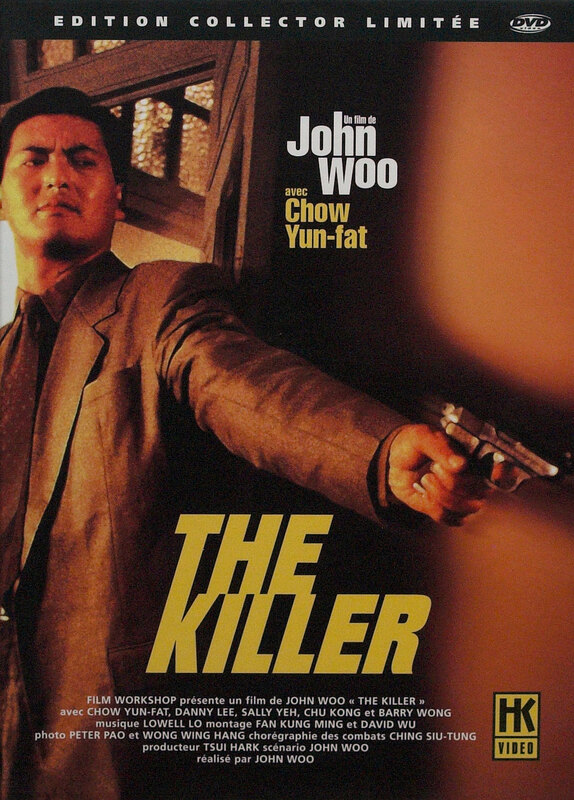 That movie was John Woo’s action masterpiece THE KILLER. I only relate all this because I know how much time has passed between then and now and for most of you reading this, you’ve seen so many action movies that you have absolutely no idea of the impact that THE KILLER made when it first came to American theaters. Trust me. THE KILLER was like nothing else we had ever seen. 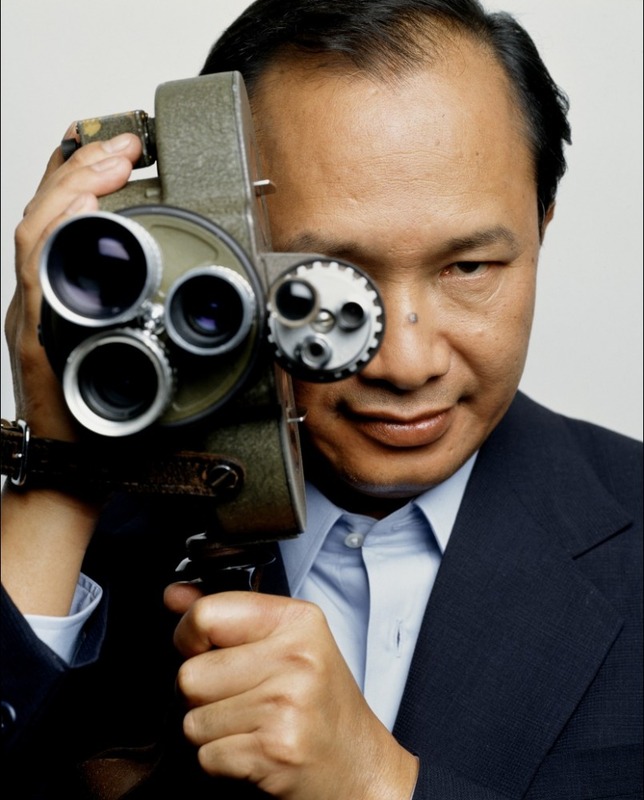 For me, it was my first exposure to John Woo and yes, my movie going life was never the same again. Master assassin Ah Jong (Chow Yun-Fat) wants out of The Triad and agrees to take one last job in return for his freedom. During the job he accidentally blinds the nightclub singer Jenny (Sally Yeh) while trying to protect her from getting shot. Ironically it’s the muzzle flash from his own gun that blinds her. Filled with remorse, Ah Jong visits Jennie at the club every night after he blinds her to listen to her sing and they fall in love. She has no idea he’s the reason for her being blind and Ah Jong determines to get enough money to take Jenny to America so that she can have a corneal transplant. In order to get that much money, Ah Jong has to take a high-risk hit. The hit goes bad and during his escape, Ah Jong is identified by a police detective, Li Ying (Danny Lee) who becomes obsessed with capturing Ah Jong. Li Ying is the perfect guy to catch Ah Jong since he’s on thin ice with his bosses who consider him pretty much a wild bull on thin ice anyway. But he has a gift of putting himself in the mindset of criminals and he finds it pretty easy (maybe too easy ) to get into Ah Jong’s head. Ah Jong has to not only stay out of the gunsights of the police but also his Tong boss Wong Hoi (Shing Fui-On) who has ordered a hit on Ah Jong since his identity has been compromised. What makes THE KILLER so unique is in that Ah Jong’s pursuer Li Ying becomes his closest friend and ally as the both of them discover that they’re mirrors of each other, bound together by similar personal codes of honor and loyalty. Even today when I watch THE KILLER I am astounded by the action sequences. The final shootout in the church is the second best shootout I’ve ever seen on film and it’s earned by the fact that when it comes, we’re totally invested in the characters so we care who lives and who dies. THE KILLER has a great story that is both tremendously simple and yet overwhelming complex at the same time. It’s pretty simple why Ah Jong takes on the responsibility of restoring Jenny’s sight. It’s pretty simple why Li Ying comes to admire Ah Jong. What’s not so simple is how these characters have their own agendas that come into play and have to be resolved in blood. This is the movie that made Chow Yun-Fat a star in this country. He’s got the same kind of badass cool that made Sean Connery, Steve McQueen and James Coburn stars and it’s all there on the screen in this one. I also like Danny Lee a lot because of his character and his acting talent we to see a lot of the Ah Jong character through his eyes as he gets inside the head of his quarry. And the gunfights…good googly moogly…us provincials here in America had never seen gunfights like this until John Woo said “Here…let me show you how it should be done.” And he did. Each and every gunfight in THE KILLER is epic. And this is the one that begins the classic. quintessential John Woo standoff with two guys pointing guns in each other’s faces. This one has Ah Jong and Li Ying maintaining the pose that they’re having a nice, quiet and friendly conversation in Jenny’s apartment while she serves them tea. But all the while they’ve got guns on each other. Being blind she can’t see the guns. It’s a scene that’s both hilarious and suspenseful to the max. So should you see THE KILLER? Without a doubt, YES. I remember me and my friends walking around Boston looking for a VHS copy of THE KILLER. It really was this mythical beast everyone into movies had to find and watched. When we finally got it, we watched the hell out of it. Fantastic story, Derrick. Thank you for another awesome review at The Ferguson Theater, Derrick! I am very ashamed to admit that I never saw this movie before, and in fact have barely heard of it over the years. 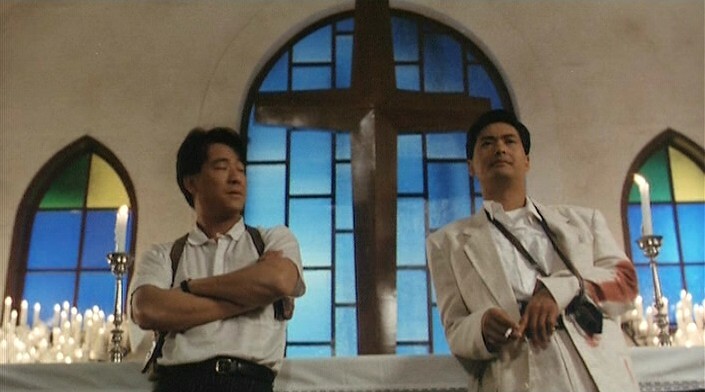 I’ve been a big fan of Chow Yun-Fat, though, as one of my all-time fav action films was “The Replacement Killers.” He really has a natural knack for bringing sympathetic and emotionally complex hit men to the screen. In fact, I totally hope that you eventually review that movie here, especially now that I know you’re also a Yun-Fat fan! I SAW THE DEVIL is one of those movies that has been in my Netflix queue for the longest as somebody recommended it to me last summer. I just haven’t gotten around to watching it but because you give it a Must See endorsement, Christofer, I’ll make time this weekend to check it out. Deal? Deal! 🙂 I think there will be a really good chance you’ll find the movie more than worth a review! I’ll be checking out “The Killer” this weekend, as per your own recommendation. I saw this one on Cinemax when I was 14 or 15. I was the kid who introduced it to my high school. I was the first fifteen year old with a trenchcoat. Hell, I may have started the whole trenchcoat mafia thing for all I know. All because of The Killer and later Hard Boiled and A Better Tomorrow. Great post, man. I can only imagine what seeing this in a packed theater was like. Like seeing Enter The Dragon for the first time in America, maybe. No doubt, from that first time Chow stomps the table and flips the gun into his hand, I was a Woo fanatic.